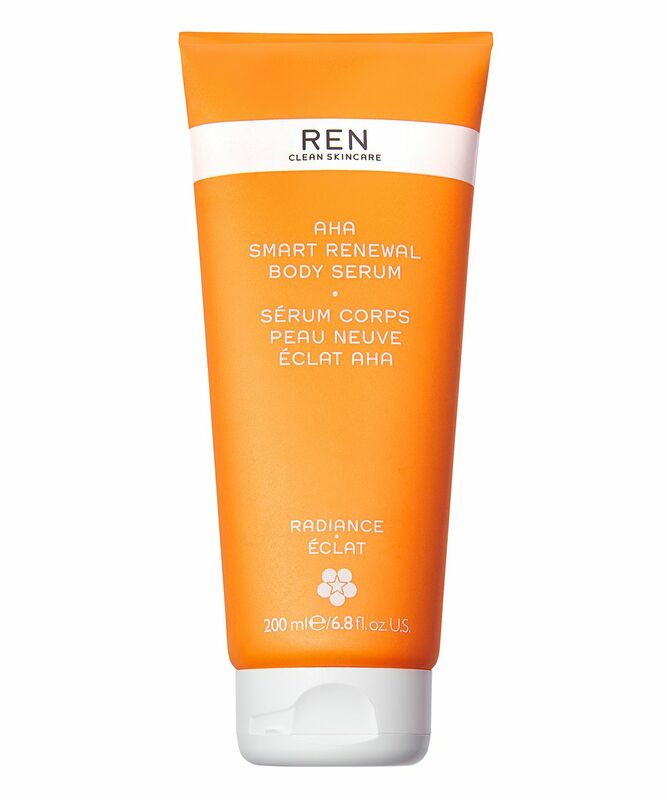 If you’ve already discovered the transformational benefits of alpha hydroxy acids on your complexion, it’s time to introduce them to your entire body… REN CLEAN SKINCARE’s ingenious renewing body serum boosts your skin’s natural exfoliating process, deeply hydrating skin for an even, hydrated and healthy-looking glow from top to toe. Known for pioneering new ways of applying the latest discoveries in phyto-science and mineral technology to skin care, REN is the perfect way to add some innovation to your skin ritual. A new breed of body moisturiser, REN CLEAN SKINCARE’s AHA Smart Renewal Body Serum utilises alpha hydroxy acids to boost your skin’s natural exfoliating process and leave skin gorgeously glowing. Lightweight yet luscious, this body serum is rich in lactic acid and xylitol, which have the superb ability to attract water molecules already present in your skin to the surface. As well as this, alpha hydroxy acids dissolve the bonds that bind dead, dulling cells to your skin’s surface, sloughing away this unnecessary layer to reveal the bright, even skin beneath. The sumptuous serum also improves your skin’s moisture barrier, deeply hydrating to leave everything looking healthy, plump and luminous. Gently massage onto clean skin until absorbed. AHAs work with the skin to naturally exfoliate away dull skin leaving your skin radiant with a natural glow. Always protect your skin with SPF after using AHAs. CAUTION: Do not use on irritated skin and discontinue if irritation occurs. Consult your doctor if irritation persists. Avoid contact with eyes, and if eye contact occurs rinse well with warm water. Do not use with any other exfoliator (body scrub, exfoliating gloves and sponges, etc.). Do not sunbath while using an AHA product. Discontinue the application at least 2 weeks before sunbathing. Use adequate sunscreen protection while using and AHA product and for a week after you discontinue use. Truly great body lotion that keeps skin smooth. I have Keratosis pilaris pretty much all over my body and this is one of the few lotions that can make my skin ultra soft. Keep in mind that regular exfoliating is most important, but this definitely helps on top of my weekly exfoliation routine.